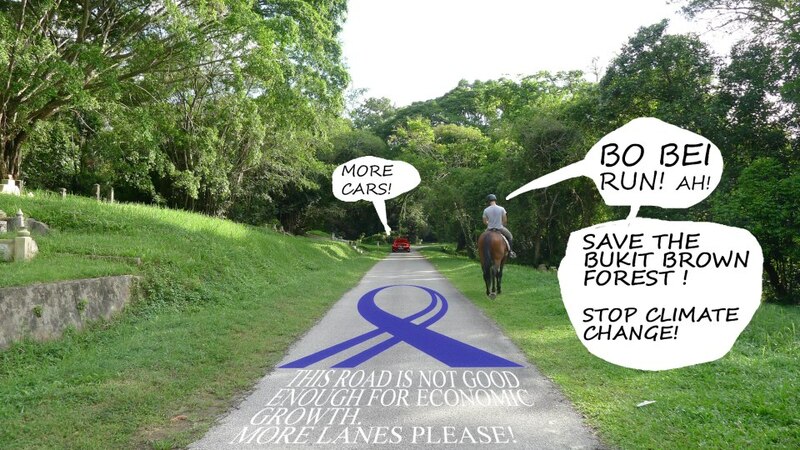 We urge the government to reconsider building a road through Bukit Brown Cemetery in 2012. We wish to save Bukit Brown 100%, and make it a national park to showcase Singapore’s heritage and biodiversity. Bukit Brown is an invaluable historical site for a young nation seeking to define itself. There are about 100,000 graves that house the remains of pioneer Singaporeans from all walks of life. Their contributions and sacrifices helped to lay the foundations for Singapore’s success today. Bukit Brown is a necessary green lung and wildlife sanctuary for a sustainable city. A 200-hectare woodland habitat, the cemetery is home to wildlife including 86 species of birds, 12 of which are vulnerable, endangered or critically endangered. Bukit Brown should become a heritage park and public space to be enjoyed by all. All Singaporeans and visitors should be able to visit the park and appreciate its historical value and natural beauty. Opening the Circle Line shell station at Bukit Brown will allow easy access to the park. With only 111 cars per 1,000 people in Singapore, Bukit Brown’s destruction is unnecessary. Enable future generations to write their Singapore Story with it. Once lost, it is lost forever.